Sunshades are an attractive means to obstruct undesired sun and heat gain while allowing natural light into your building. 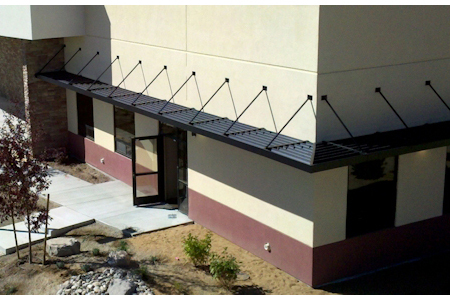 Sunshade louvers add an attractive design element to your building. Numerous blade shapes, blade spacings, and trim profiles allow a design to suite your project requirements. The objective of a sunshade is to block the entry of direct sunshine into your building throughout the cooling season, while allowing direct sunlight during the heating season. This combination provides the greatest benefit for reducing energy consumption over the life of your building. Achieving this combination depends on several factors that can be viewed in our How Sunshades Work section. Sunshades should blend with other building design elements and provide the desired appearance. Choose from our array of blade profiles, blade spacings, and trim styles to add an attractive architectural element to your building. A variety of finishes are available from our Sunshade Finishes selection chart. Sunshades can be painted with a baked enamel or Kynar 500 finish, or have an anodized finish applied. A variety of standard colors are available. Custom colors can be selected by sending us a color chip. We will use our computer color match system to precisely match the sunshades color to other building facade components. Installation for Architectural Louvers sunshades is simple. Each sunshade is equipped with outriggers for mounting to the building structural framing with mounting brackets (provided). Applicatons with larger sunshades require rigging support, which may be provided with your order.